Hedy Lamarr was generally considered to be a glamorous star. Joan Collins and Sophia Loren - two icons of glamour. Glamour is the impression of attraction or fascination that a particularly luxurious or elegant appearance creates, an impression which intensifies reality. Typically, a person, event, location, technology, or product such as a piece of clothing can be glamorous or add glamour. "Glamour" originally referred to a magic spell, an illusion said to be cast by witches. "Glamour" originally referred to a magic spell, an illusion said to be cast by witches, particularly associated with witches of Roma ("Gypsy") origin. In the late 19th century terminology, a non-magical item used to help create a more attractive appearance gradually became known as 'a glamour'. 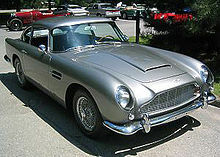 An Aston Martin DB5 as seen in Goldfinger. Expensive items are often part of a glamorous lifestyle. Many forms of architecture employ glamorous motifs to enhance the appearance of what may be otherwise mundane buildings. The Art Deco style is generally considered to be a glamorous one. The "Golden Age" of "Hollywood Glamour" was the 1930s and 1940s, following the depression and its aftermath. Glamour is the result of chiaroscuro, the play of light on the landscape of the face, the use of the surroundings through the composition, through the shaft of the hair and creating mysterious shadows in the eyes. In Hollywood, stars as far apart as Marlene Dietrich, Carole Lombard, Rita Hayworth and Dolores del Rio, own and acquire glamor, technology and willingness to refine the beauty of its own... Are indecipherable magic of the cinema, substance of the dreams of a generation and the admiration of the following meeting", -filmmaker Josef von Sternberg, . Hedy Lamarr is quoted to have said "Any girl can be glamorous. All you have to do is stand still and look stupid." Glamour icons are people that are thought to epitomise glamour, that have an individual style that makes them more attractive. A glamour photograph of Michele Merkin. Look up glamour in Wiktionary, the free dictionary. ^ a b Fulford, Robert (13 September 2003). "Art Deco's glamour: Art Deco borrowed from the style of machines. The Deco artists loved surfaces that glittered, surfaces of glass, silver, steel, lacquer, then chromium and Bakelite". robertfulford.com. Retrieved 20 November 2010. ^ a b c d e f g h "TED conference Virginia Postrel". ^ a b "The Gilded Age". The New York Times. 2004-10-10. Retrieved 2010-05-03. ^ a b c d e f Clout, Laura (2007-11-04). "Vogue names Queen as glamour icon". The Daily Telegraph. London. Retrieved 2010-05-03. ^ a b c "Bookcost.net homepage". Archived from the original on 2011-07-23. Stephen Gundle (2002). "Hollywood Glamour and Mass Consumption in Postwar Italy". In Rudy Koshar (ed.). Histories of Leisure. Berg Publishers. pp. 337–360. ISBN 9781859735251. Réka C. V. Buckley and Stephen Gundle (2000). "Fashion and Glamour". In Nicola White; Nicola Joanne White; Ian Griffiths (eds.). The Fashion Business. Berg Publishers. pp. 37–54. ISBN 9781859733592. Jeffrey Richards (1984). "Stars". The Age of the Dream Palace. Routledge & Kegan Paul PLC. pp. 157–158. ISBN 0-7100-9764-6. This page was last edited on 6 February 2019, at 16:28 (UTC).